Welcome to PostgreSQL version 9.3. 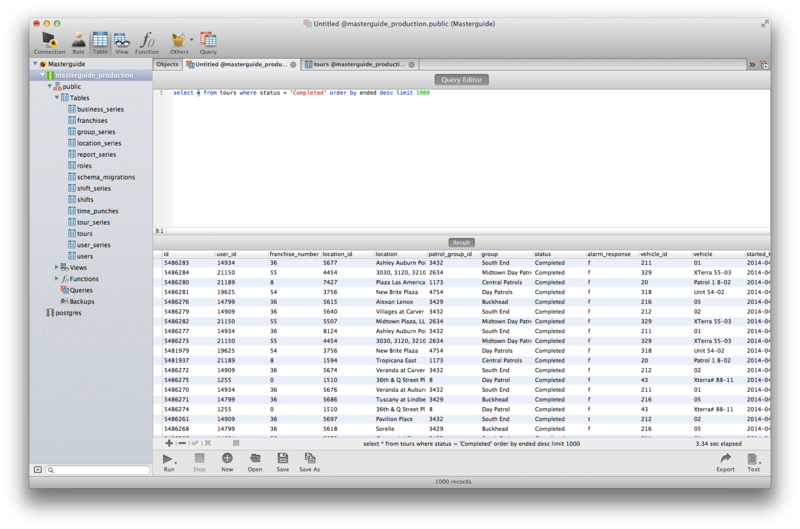 Among other advanced features, this database allows for native JSON querying. You can open the tables to reveal their data and design. Foreign keys for joining tables are self-evident and named appropriately. For example: 'franchise_number' joins on the 'number' column in the franchises table. You'll see that a lot. If you need new indexes created, or new users created, please submit requests to us here through Zendesk. We recommend using Navicat Essentials for PostgreSQL. You can also use PostgreSQL Admin for free. Build complex queries and save your work for later revision and reuse. 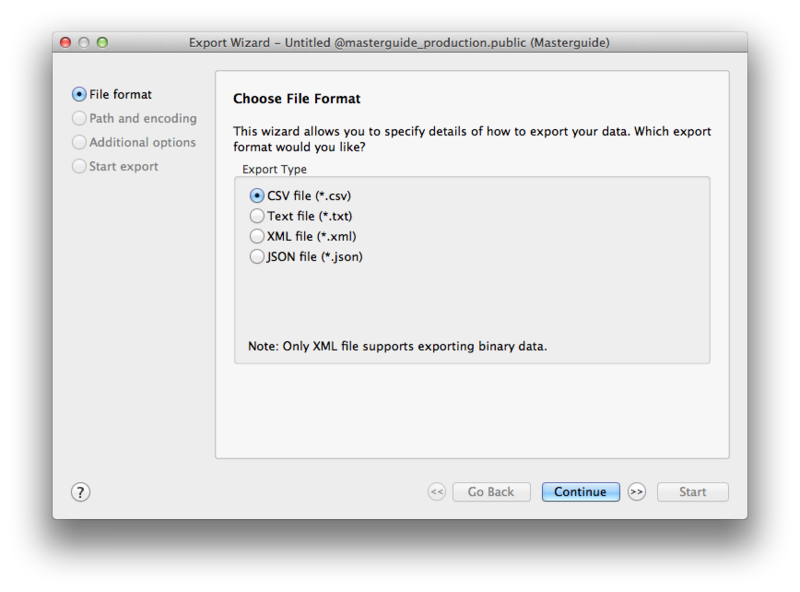 Export whatever dataset you're looking at with the click of a button. Joins between the 'users' and 'roles' and 'franchises' tables because any one user can have one to many roles, but only one role per franchise. This will mean that the same users will appear multiple times in the results set if they're authorized for more than one franchise market. Returns 7125 records at the time of this example. Returns 1 result showing the total amount of authorizations (roles) breaking out the percentage of active and inactive. This is one way of accomplishing it. Feel free to run any of these examples to see the output and/or tinker with the variables. Just copy/paste the queries into your query browser of choice after you establish a connection. Then we can easily use the Navicat export option to choose what type of file we want, step through the options, and save the results set to whatever local resource we want. All Masterguide Dates/Times are in UTC. This is because there needs to be a unified and standard way of storing all dates in the system across all timezones. Using SQL Date/Time functions, you can easily convert whatever Date/Timestamp you want to whatever local offset you desire. We recommend http://www.worldtimebuddy.com/ to get the offset from GMT that you need (GMT and UTC are synonymous for our purposes). Since we know CDT is - 5 from UTC, we want to subtract that amount of hours from the 'ended' column in the 'tours' table before making the comparison… We also want to narrow the results to the Omaha market, which is 'franchise_number' 0. You can see that by adjusting the ended value before the comparison, we achieve the desired result. Sure enough, as in the example below, we see that the last tour was Completed a mere 35 seconds before midnight on the 30th when adjusted for CDT. Documentation & Google is your friend! You can learn all about any type of manipulation, operators, and functions, from your most basic to more advanced features, in the PostgreSQL 9.3.4 Documentation. Google is also a great resource if you're looking to do something fancy or complicated. There are great communities like https://stackoverflow.com out there that will help answer questions, and many similar questions to most things that you'd want to do with the data already exist for your instant edification. And, as always, we're here to help. Start a conversation in the comments below, or submit a ticket!